New Look has been fantastic this season for affordable and up to the minute fashionable shoes. I spotted these absolutely gorgeous Cream and Black Lace Ankle Boots and fell instantly in love with them and knew they just had to be mine. Perfect for parties and actually surprisingly super comfortable. 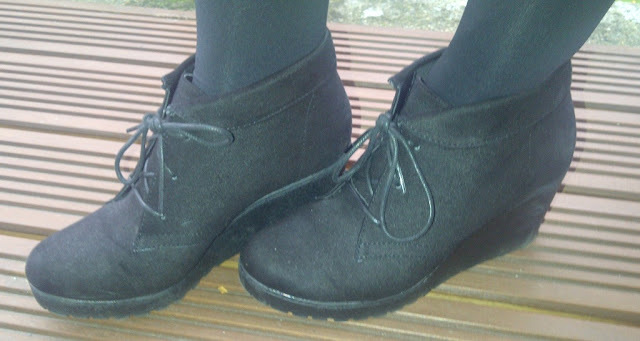 I seem to have a thing for shoe boots this Autumn/Winter and earlier in the season I purchased these black suede effect lace up ankle boots with a wedge heel. Suitable for every day but smart enough to dress up for evenings. I love the cream and black lace boots, there are so many outfits that these would work with, have you any idea what the heel height is? Does anyone know where to get the shoes from the first picture from? because new look have stopped selling them! So annoying when they do that!